Author: Le Guin, Ursula K. Set In . . . Description: To walk a street is to be told a story. Blue Moon over Thurman Street weaves a story not only of a particular street but of an American way of life. For more than thirty years, Ursula K. Le Guin has walked Thurman Street in Portland, Oregon, listening to its story and dreaming of a book in which to share it. 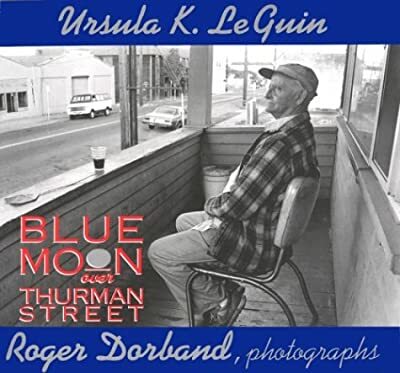 On a blue moon in July 1985, Le Guin enlisted the photographic talents of Roger Dorband, a fellow Portlander, and they collaborated for seven years to tell this story. Le Guin's handwritten poems, Dorband's creative photographs, and their collaborative observations take you on a personal guided tour of a street that crosses America. Once you've finished the walk up Thurman Street, consider sending a friend on of the postcards attached to the inside flaps. Share the Journey!